To make this polyhedron using Stella 4d: Polyhedron Navigator (a program which is available at this website), I started with an icosidodecahedron, augmented all faces with prisms of height 1.6 times greater than their bases’ edge length, and then took the convex hull of the result. I’m proposing it as a candidate for the loosely defined group of polyhedra called near-misses to the 92 Johnson solids: convex polyhedra which are almost, but not quite, Johnson solids, due to slight irregularity in some of their faces. 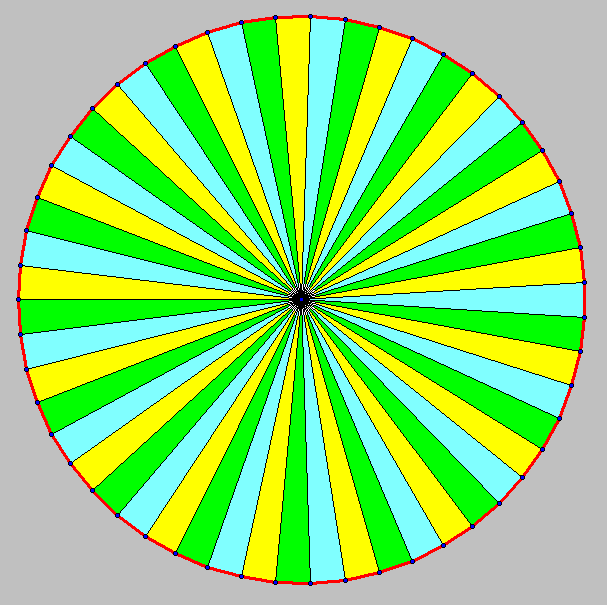 In this case, the pentagons and green triangles are regular, and have the same edge length. The blue triangles, however, are isosceles, with vertex angles of ~67.6687 degrees. The yellow almost-squares are actually rectangles, with edges next to blue triangles which are ~2.536% longer than the edges next to pentagons or green triangles. I stumbled upon this design earlier today, while simply exploring polyhedra more-or-less randomly, using Stella. Below is the prototype I found at that time, which I merely made a .gif of, but did not perform measurements on. In this prototype, the most significant difference I can detect is in the yellow faces, which are trapezoids, rather than rectangles, since the pentagon edge-length is slightly longer than that of the green triangles. Behold! It worked — all of the faces are perfectly regular. However, that caused another problem to appear, and you can see it most easily by looking at the blue triangle-pairs: this polyhedron is slightly non-convex. It’s also easily described as a truncated dodecahedron, with each of the twelve decagonal faces augmented by a pentagonal rotunda. 1. Has this polyhedron been found before? 2. Is it close enough to regularity to qualify for “near-miss” status? If it hasn’t been found before, but is judged unworthy of “near-miss” status, it will at least join the newly-described group I call “near near-misses” — polyhedra which don’t quite qualify for near-miss status, by visual inspection. Obviously, this new group’s definition is even more “fuzzy” than that of the near-misses, but there is a need for such a category, nonetheless. After using Google to find the image of this galaxy, I used software called Stella 4d (available at http://www.software3d.com/Stella.php) to project it onto the twelve pentagonal faces of an icosidodecahedron, and then hid the triangular faces, as well as the vertices and edges — and then set the galaxies to rotate on the faces, as well as around the axis of the polyhedron. This is simply the inverted-color version of the second image in the last post on this blog, where I explain how to construct this 51-sided polygon using compass and straightedge, starting with the heptadecagon, which has 17 sides. After completing the heptadecagon construction shown in the last post on this blog, I wondered if I could pull off a similar trick to the one mentioned there of combining the pentagon and triangle constructions to construct a regular pentadecagon — but using the heptadecagon and triangle, instead, to construct a regular polygon with (17)(3) = 51 sides, known as the henkaipentacontagon. The answer: yes, I was able to, but certainly not in the simplest way possible, for I ended up having to go to 204, first, to get to 51. First, I extended two adjacent radii of the heptadecagon in the upper left as rays, just to give me room to work. Next, I placed point B1 on the lower of those two rays, to be used as the center of the large circle in which to construct my 51-sided regular polygon. I then constructed a line through B1 which was parallel to the upper of these two rays, thus duplicating the ~21.17647º central angle of the heptadecagon, but in the center of my new, larger circle. Next, I constructed the yellow equilateral triangle with this heptadecagon-central-angle inside it, in such a way that the lower half of the yellow triangle would be a 30-60-90 triangle, ΔA1B1C1, with the ~21.17647° angle inside, and sharing a ray with, this triangle’s 30° angle. By subtraction, that made a ~8.8235° angle, with its vertex at the center of the largest circle shown. Next, I divided ~8.8235 into 360 . . . and, to my dismay, didn’t get a whole number as an answer, but 40.8, instead. I then noticed that one can multiple 40.8 by five, and obtain 204 as the product. Armed with this knowledge, I used my ~8.8235° angle, and 204 circles of equal radius, to locate 204 points, evenly-spaced, around the large circle. 51 is one-fourth of 204, so I connected every fourth point around the large circle with heavy blue segments, and made those 51 points (one fourth of the total) blue, as well. These blue points and segments are the sides and vertices of the regular henkaipentacontagon, shown inscribed, above, inside the largest circle in the diagram. Since this polygon looks a lot like a circle, I then rendered a lot of things from the diagram above invisible, in order to produce this second image: the henkaipentacontagon alone, with different colors for its vertices and sides, all radii added, and three alternating colors for the 51 triangles each formed by two adjacent radii and a side. I have just completed my first construction of the regular heptadecagon — a construction that even the ancient Greeks were never able to figure out. They did figure out how to construct a regular pentadecagon (by combining the constructions for the regular pentagon and triangle), and I once replicated that discovery, meaning that I figured it out independently. The regular heptadecagon construction, however, I did not figure out independently. I used instructions found here (http://www.mathpages.com/home/kmath487.htm), which built on the work of Carl Friedrich Gauss, who, in 1796, at the age of 19, became the first person in history to determine that such a construction is possible with the traditional Euclidean tools. A word of warning, if you attempt to replicate this construction yourself: points M and G are merely close together, but are not in the same place. Point M is the center of the circle which passes through points D and V17, while point G is one of the two points of intersection of (1) the line passing through points O and V17, and (2) the circle centered at C, and passing through E.
Gauss (and other mathematicians, building on his work) also showed, later, that constructions are possible for regular polygons with 257 sides, as well as 65,537 sides. I might, someday, replicate the construction of the regular polygon with 257 sides. A man named Johann Gustav Hermes once spent ten years completing a 200-page manuscript showing how to construct the regular polygon with 65,537 sides, and I believe he actually performed the construction, as well. I will not be constructing this polygon — ever. I will, however, figure out a proper name for it. Let’s see . . . it’s the heptakaitriacontakaipentacosioikaipentachilikaihexamyriagon. Try saying that five times in a row, quickly! Some angles are constructible, in the Euclidean sense that they may be constructed with the traditional geometricians’ construction-tools: a compass, and an unmarked straightedge. Examples include every angle shown above, such as the 108° interior angles of the purple regular pentagon, or the 60° angles of the yellow triangle. Angle LEN is constructible as well, and measures 48° — but to construct it, one must use compass-and-straightedge subtraction (the 108° pentagon angle HEK, minus the 60° triangle angle KEL). After constructing this 48° angle, I bisected it repeatedly, to show that angles measuring 24, 12, 6, and 3, and 1.5 degrees may be constructed as well. The 1.5° angle NET is shown with a blue interior. Many other angles are non-constructible. For example, the angle between two adjacent radii of a regular enneagon (also called a nonagon) measures 40°, and so, because it has been proven that the regular enneagon cannot be constructed with the traditional Euclidean tools, it follows that 40° angles are non-constructible. If they were constructible, however, the subtraction-trick I used earlier to construct a 48° angle could be used, again, to construct an 8° angle (48° – 40°) — so 8° angles, therefore, are also non-constructible. Since repeatedly bisecting an 8° angle would yield angles measuring 4, 2, 1, 0.5, o.25, etc. degrees, all of these angle-measures are for non-constructible angles. One full rotation would be a rotation of 240 euclids. A right angle is one-fourth of that, or sixty euclids. The interior angles of equilateral triangles measure forty euclids, and the interior regular-pentagon-angle of 108° becomes 72 euclids, in this new, proposed system. 360 has been used as the basis of the degree for reasons both historical and mathematical. Sixty, and its multiple 360, appear as important numbers in several ancient cultures, and 360 also has many whole-number divisors, having a prime-number factorization of (2)(2)(2)(3)(3)(5). However, 240 has similar properties. As I have shown, it is based on the Euclidean construction-rules from ancient Greece. The number 240 also has many whole-number divisors, since its prime-number factorization is (2)(2)(2)(2)(3)(5). A simple “e,” by itself, would not do, for that would cause confusion with the important number e — the base of natural logarithms, among other things. 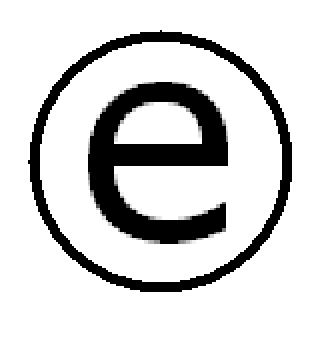 That is why I included a circle, surrounding the letter “e,” for this symbol. In superscript form, this symbol for the euclid would resemble the well-known copyright symbol — but, fortunately, the copyright symbol is not, itself, copyrighted. I could not have made this without Stella 4d, software you can try for free (as a trial version), or buy, at http://www.software3d.com/Stella.php.